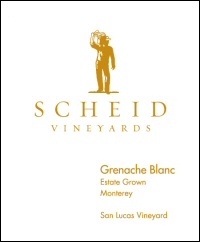 Grenache Blanc produces rich wines with tremendous body and crisp acidity. Our wine displays exquisite aromas of bright green apple and mandarin orange unfolding into layers of honeysuckle and lime with a clean, mineral edge. e palate is soft and round with a full, lingering, floral finish. e grapes were exclusively handpicked from our San Lucas Vineyard. Grenache Blanc is a large-clustered grape, requiring multiple cluster thinning passes throughout the growing season to ensure optimal ripeness and flavor development. Our 1.98-acre block at our estate San Lucas Vineyard is a perfect little spot for this variety, with warm days to ripen and bring out the rich fruit flavors and cool nights to maintain acid levels. The 2015 growing season delivered another stellar vintage in terms of quality although yields were down in almost all of our vineyards. Despite a lighter crop from one of the earliest seasons on record and a fourth year of drought, quality was high across the board. A mild winter caused early bud break and was followed by protracted bloom and cool, cloudy weather in May—impacting berry set and contributing to smaller grape clusters and crop size. e silver lining to the lower yield is the exceptional quality, with vivid, intense flavors. e juice was slowly fermented in stainless steel at 55˚F to enhance the fruit esters and preserve the varietal aromatics. The wine was aged in 100% stainless steel for six months. The result is a gorgeous, fruit-packed Grenache Blanc with layers of complexity that still retains its freshness.